We have the best selection of broadcast quality high definition cameras available anywhere. Be sure to take a look at the many other accessories we offer including lenses, camera support, lighting, audio, and grip. Featuring a unique Super 35mm Canon CMOS sensor, revolutionary Canon DIGIC DV III Image Processor and 50 Mbps 422 codec, the EOS C300 provides outstanding cinema quality movie capture. Compact, modular and compatible with Canon's existing line-up of EF and new EF Cinema lenses as well as accessories from third parties, the stunningly simple to operate EOS C300 is designed to please cinematographers for any production large and small, on location or in the studio, from shoestring to Hollywood budgets. The EOS C300 has a Canon EF lens mount and is compatible with all of Canon's new EF Cinema lenses and current EF lenses, including compact primes, super telephotos, specialty tilt-shift, macro and fisheye - over 60 in all. And with an entire support infrastructure designed to help you get the most from your equipment before, during and after production, the EOS C300 is ready to go to work. The ARRI ALEXA EV Digital Cinema camera is designed for broadcast, motion picture and commercial applications. Using the new ALEV III Super-35 sized CMOS Bayer-pattern sensor, the ALEXA is capable of 1920x1080 HD outputs as well as 3.5K Uncompressed RAW. ALEXA shoots 1-60fps with a base sensitivity of 800 ISO and can record in ProRes via internal hot-swap SxS cards (with optional upgrade), or output Uncompressed HD-SDI or ARRIRAW. Phantom HD GOLD is capable of resolutions beyond 2K, with frame rates in excess of 1000 fps at 1080p and 1500 fps in 720p. The camera boasts an excellent dynamic range and a high sensitivity (ISO 640) making it useful even under normal lighting conditions. Unlike with film, and some other digital high-speed cameras that require rendering, you can immediately see the results of your shot. The camera records to an internal RAM memory that can then be downloaded to a laptop computer. Phantom CineMags provide hot-swappable, solid-state recording in 256 and 512 GB models. The Phantom HD GOLD also allows you to "play" the contents of the memory module over single (4:2:2) HD-SDI outputs on the docking station to a recorder, disk array, or other HD-SDI capture device. Essentially the same as the JCV HD110. This HDV camera is a very popular one, used extensively by MTV and some of the networks . Of all the Mini HD cameras this is the only one that can easily accept (with an adapter) any standard "B" (Sony) mount lens, therefore working well on Jimmy Jibs and other remote situations not to mention the wide range of additional optic options. 24P and 720P it matches well with the Panasonic Varicam. Panasonic's AG-AF100 Micro Four Thirds Professional HD Camcorder represents an enormous leap forward in affordable, cinema-quality video imaging. Providing all the professional features that videographers expect in an interchangeable-lens camcorder--manual video and audio control, variable frame rates, HD-SDI and HDMI output, XLR inputs, timecode--the AG-AF100 plays its trump card with a large, 4/3-type image sensor. At 13 times the size of comparably priced 1/3" sensors (and almost 4 times larger than the 2/3" chips found in cameras costing more than twice as much), the AG-AF100's sensor brings the richness of DSLR video into a professional form factor. Camera body with standard HD lens also includes batteries, power supply and charger. Essentially the same as the HPX170 but this camera is specially configured to be switchable between both PAL and NTSC. The Panasonic AG-HPX610PJF Camcorder features a single 2/3" MOS Sensor and records Full HD 1080p video to P2 media card slots in AVC-Intra 10-bit with 4:2:2 chroma sampling. The camera will also record using other codecs including DVCPRO HD, DVCPRO50, DVCPRO, and DV. The camera supports recording rates up to 1080 59.94i, 720 60p, and will also record 24p native at 23.98. The HPX610 accepts lenses designed for three chip cameras, even though it features a single MOS sensor, and does not use a prism. As 2/3" ENG-style lenses are designed taking into account the prism, and normally require an adapter to work with single sensor cameras, Panasonic has set the sensor depth of on this camera to compensate for the lack of a prism. Possibly the most versatile HD camcorder in production, the Varicam is the first variable frame-rate DVCPRO HD camcorder available for the professional cinematographer. It offers a wide variety of frame rate capabilities: still-frame, step-frame, 24-fps, 30-fps and 60-fps. Such versatility combined with a cinema-quality 720p HD image lends the camcorder to high-end documentary projects and feature-filmmaking. With a weight of only 15lbs (WITH battery & cassette) and approx 25% smaller than other broadcast camcorders, the Varicam is a superb in-the-field camera which makes light work of day-long handheld shoots yet still provides the quality and features of top-of-the-line broadcast equipment. Superseding the previous Panasonic HDC27F, the new "H" model Varicam, although fully backward compatible offers a number of new important features including: a newly developed 3CCD system, 12-bit A/D converter, new high-resolution emulation mode, lens files can be written to the removable SD Memory Card, two individual HD-SDI outputs and Frame rate switching assignable to a user preset buttons. 2/3 3-CCD 16:9 P2 HD VariCam Camcorder. The VariCam 2700 offers intuitive operation with single-step variable frame rates ranging from 1 fps to 60 fps (in 720p mode), advanced gamma settings, and essential interfaces including three HD-SDI outputs. Utilizing three 1-megapixel 2/3-inch native HD resolution CCDs, the VariCam 2700 records independent-frame 1080 and 720 images in AVC-Intra 100 and AVC-Intra 50 as well as in industry-standard DVCPRO HD. With five 64 GB P2 cards installed, the VariCam 2700 can record up to 400 minutes in AVC-Intra 100 at 1080/24p, 800 minutes in AVC-Intra 100 at 720/24p and 320 minutes in other other AVC-Intra 100 or DVCPRO HD formats. 2/3" 3-CCD 1080 P2 HD VariCam Camcorder with 4:4:4 Capability. Designed to capture feature films, television episodics and commercials, the AJ-HPX3700 is Panasonic's new workhorse camera producing uncompromising cinematic image quality with the exceptional reliability and faster workflow of solid-state P2 HD. The VariCam 3700 raises the bar for cinematic image quality, offering a native 1920x1080 imager, including 10-bit, 4:2:2 full-raster recording (AVC-Intra 100), as well as Dual link RGB 4:4:4 output with log response capability. The 2/3" 2.2 mega-pixel, 3-CCD camera records high resolution, independent frame HD images in AVC-Intra 100, for the highest level of quality; in AVC-Intra 50 for extended recording; and industry-standard DVCPRO HD for added flexibility. The world's first consumer 1080i high definition camcorder, the Sony Handycam HDR-FX1. A revolution in form and function, the HDR-FX1 allows you to play and record interlaced high definition video at resolutions up to 1440 x 1080 for professional quality video with vivid colors and striking detail. It even offers the ability to switch to standard DV recording and playback as the situation warrants. The HDR-FX1 features the Real-time HD Codec Engine, which offers professional-level MPEG2 video compression, and 14bit HD DXP (Digital Extended Processor) for increased processing speed. Images are captured on three chip Advanced HAD CCD system that provides increased detail and improved video performance without the color bleeding found in other system. Optical capabilities include a Carl Zeiss Vario-Sonnar T* lens with 12x optical zoom and Super SteadyShot image stabilization. The HDR-FX1 offers an unprecedented amount of control to the user, including manual zoom, focus, and iris control. Picture Profile allows the user to create a number of preset video modes for a variety of shooting settings. Composing shots is easier than even with the 3.5-in precision hybrid SwivelScreen LCD display1 and the extra-large electronic viewfinder. The smallest High Def camera 1080i Handycam there is! Complete with wide angle attachment. HD and SD Recording Modes. Dual Record Mode lets you capture 2.3 Megapixel stills while shooting HD video. Smooth Slow Recording captures fast movement with precise detail for slow motion playback. If you need to be low key, or if you want to mount an HD camera on a helmet, and don't want the bulk and weight of the typical HDV camera, this is your camera. An amazing piece of engineering. The HDW F900 is capable of record/playback of 1080 progressive at 23.98 or 24 or 25 or 29.97 or 30 frames per second or 50 or 59.94 or 60 fields per second at 1080 interlaced. Shooting at 24p allows for frame-for-frame video to film transfer. NTSC or PAL. *Price is for body and b+w viewfinder only. Other accessories shown are not included. *Price is for the F900 body, Sony HDVF C30W color viewfinder, and the standard b+w viewfinder. Other accessories shown are not included. Sony HVR-A1E 1/3" Professional HDV Camcorder with 3-Million Pixel CMOS Imager, High Definition HDV, DVCAM and Mini DV Recording Options, Professional Audio Inputs and Time Code. The HVR-A1E is a tiny camera capable of recording in several frame rates including PAL. When it is set up to record standard definition video this camera is a PAL device that stripes the tape at 30 interlace frames per second. When it is selected to record in HDV it can record 50 or 25 frames per second. Its widescreen chip captures over 1000 horizontal lines and 1440 vertical lines no matter what you dial in for record format. The HVR-HD1000U Digital High Definition HDV camcorder features a shoulder mount design and matte black color, designed to meet the growing demand of HDV users for greater mobility and professional appearance. With premium design characteristics and high-definition 1080i recording capability, the HDV-HD1000U is ideal for weddings, corporate communications, colleges, universities, sporting events, and working videographers on a budget. A built-in down-converter creates DV material, perfect for standard DVD productions. A special still photo mode is ideal for producing DVD cases and making wedding photo albums. The HVR-HD1000U camcorder features a Carl Zeiss Vario-Sonnar T* lens with 10x optical zoom, similar to that found on higher end professional HDV camcorders. The "Smooth Slow Rec" function of the HVR-HD1000U camcorder allows users to perform slow-motion playback by capturing images at four times faster than the normal field rate. The Super SteadyShot (optical) feature of the HVR-HD1000U camcorder utilizes an image stabilization system using an active optical lens method that functions without any deterioration in image quality. The Super NightShot function of the HVR-HD1000U camcorder allows the videographer to record objects in zero lux light levels for night-time monitoring and surveillance. The compact professional camcorders manufactured by Sony have introduced a new level of mobility for ENG and documentary-making worldwide with their superior quality and compact dimensions. These camcorders have dramatically revolutionized the traditional methods of capturing video footage. With the new Sony HVR-V1U camcorder, now you can enjoy the same mobility with the breathtaking beauty of HD picture quality. - 3-chip system, the "3 ClearVid CMOS Sensor" offers high-resolution images with rich and natural colors. - Carl Zeiss Vario-Sonnar T* lens. - True 24p and 30p Progressive scan mode. 1080i HDV camera is PAL and NTSC switchable, HD and SD switchable, and popular with networks, the BBC, and other production groups as a standalone or together with the Sony Cine Alta. Sony's new HVR-Z7U is the world's first professional handheld HDV camcorder with an interchangeable lens system. The compact design makes it easy to use and flexible when shooting applications requiring mobility and in space-constrained locations. - The HVR-Z7U accepts miniDV cassette tapes,which provide over 60 minutes recording time for HDV and DV formats, over 40 minutes for DVCAM format. - A 3.2-inch type XtraFine LCD is located on the HVR-Z7U in the same position as on the HVR-Z1U. The high pixel number of approximately 921,000 dots is around four times greater than the LCD of the HVR-Z1U, and this higher resolution allows for easier focus adjustments. - HDV/DVCAM/DV file recording on easily obtained Compact Flash cards. PAL version of the Z7U. Sony's new HVR-Z7U is the world's first professional handheld HDV camcorder with an interchangeable lens system. Sony continues to raise the bar with the introduction of its rain- and dust-proof HXR-NX70U NXCAM Compact Camcorder. This rugged little trouper is the perfect companion for those tough location shoots where weather and climate cause lesser cameras to buckle and fold. Meeting stringent dustproof and rainproof requirements, the NX70U's sealed body keeps out all but the toughest of elements, making it ideal for documentary and news videographers traveling to far-flung, unpredictable locations. But beneath the NX70U's weatherproofing is a first-class performer that hits all the professional sweet spots. Its back-illuminated Exmor R CMOS sensor combines with an ultra wide 26.3-263mm Sony G lens and Optical SteadyShot to provide outstanding full HD 1080p images even in low light. The Dual Rec function, meanwhile, lets you shoot 12.3MP stills while recording video, all of which can be captured to the unit's spacious 96GB embedded flash memory or your choice of Memory Stick or SD/SDHC media. A waterproof performance rating of IPx4 means that the main camera body is protected against rain showers and water splashes. However, it should not be submerged underwater or sprayed with pressurized water from a tap or hose. When used with accessories such as an external microphone, a rain cover should be used to protect the accessory and connection. IP5x rating does not guarantee 100% protection against exposure to extremely fine particles. The NEX-FS100U Super 35mm Sensor Camcorder is Sony's first affordable and fully professional large-sensor video camera. Hot on the heels of the PMW-F3, this compact, highly modular camera uses the same S35-size CMOS sensor as the F3. Unlike smaller, broadcast-style sensors or the larger "full-frame" sensors of some DSLRs, the NEX-FS100's imaging area matches that of standard Hollywood film cameras, providing complete compatibility with cine-style film lenses (via optional adapters) as well as any of Sony's E-Mount lenses. The sensor's large size offers a variety of other advantages, including increased control over depth of field, higher sensitivity in low light, lower image noise, and an exceptional dynamic range. Able to shoot full 1080p video in a range of frame rates up to 60p, the FS100 provides the option of recording 28Mbps AVCHD footage onto SD or Memory Stick media, or it can output uncompressed 4:2:2 video (with embedded timecode) and RGB via HDMI 1.4 to an external recording unit. Simultaneous recording to both is also possible when instant backup is called for. There's no stinting on audio, either, as the camera includes not only a shotgun microphone with mount/carrying handle, but dual XLR inputs for recording uncompressed, professional-level sound from an external source. Other features--such as a rotating 3.5" XtraFine LCD panel with detachable viewfinder, SD recording, GPS geotagging, and slow shutter--make the FS100 an impressive companion to other cameras in the S35 line. Not only will it intercut perfectly with the F3, F35, or SRW-9000PL as a 2nd unit or B camera, it can stand on its own in applications as diverse as indie film, commercials, music promos, and documentaries. Choice of Canon or PL mount. 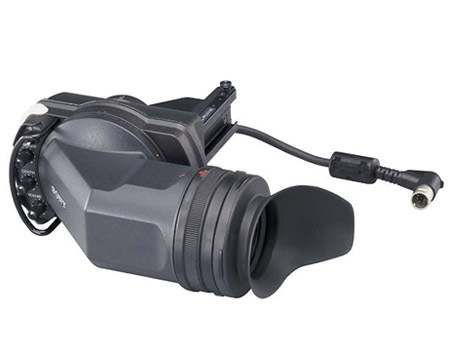 The PDW-700 camcorder comes equipped with three 2/3-inch type CCDs a newly developed "Power HAD FX" progressive CCD with 1920 x 1080 effective pixels. Stunning-quality HD images can be captured by this high-resolution CCD in conjunction with the 14-bit A/D converter and advanced digital signal. On top of the exceptional technology, the PDW-700 offers very high quality HD recording at a data rate of up to 50Mbps using the MPEG-2 4:2:2P@HL compression. It also provides multi-format recording flexibility including 1080i, 720P and SD, which comes with HD/SD conversion and cross conversion between 1080i and 720P. The PDW-F800 camcorder is the newest member of the XDCAM family. It offers multi-format recording flexibility as standard - including SD recording and a frame rate of 23.98P in 1080 mode. It is equipped with three 2/3-inch type CCDs and a Power HAD FX progressive CCD with 1920 x 1080 effective pixels. Stunning-quality HD images can be captured by this high-resolution CCD and advanced digital signal. On top of the exceptional technology, the PDW-F800 offers very high quality HD recording at a data rate of up to 50Mbps using the MPEG-2 4:2:2P@HL compression. It also provides multi-format recording flexibility including 1080i, 720P and SD, which comes with HD/SD conversion and cross conversion between 1080i and 720P. With features such as Slow & Quick Motion (over-crank and under-crank recording) make the PDW-F800 ideal for cinema and TV drama productions, as well as ENG applications. Price is for body, no lens is included. Normal and wide HDlenses are available. Our F800 cameras are supplied with Sony CBK-HD01 (at no additional charge). Sony CBK-HD01 is an optional HD-SDI input board designed for the PDW-800 XDCAM HD camcorder. This circuit board provides a BNC input connector that will accept standard definition video directly to the camera's VTR. This addition to Sony's camcorders brings selectable frame rate recording to the CineAlta family line up. Commonly known as "overcranking" and "undercranking", Sony calls this function Slow & Quick Motion. In addition, not only does the PDW-F350 record in true 24P, but also 25P and 30P at 50i or 60i. The Sony PDW-F355 XDCAM HD Camcorder provides the durability and reliability professionals have become accustomed to with their full line of ENG camcorders, while adding many new features. What sets the XDCAM HD line apart from other cameras is the ability to shoot high definition video at manageable bitrates, without sacrificing quality. Equipped with three 1/2" HD CCDs, the PDW-F355 is capable of recording a 1080i stream at different frame rates and bit rates, giving the user increased versatility to choose between quality and run time. The camera can also under and over crank, between 4 and 60 frames, which can be used for fast and slow motion effects. The PMW-200 is the successor to Sony's well respected PMW-EX1/R camcorder which supports the 50 Mbps MPEG HD422 codec and MXF recording. It is a good companion to the PMW-500 XDCAM HD422 shouldermount camera. With its three 1/2-inch Full HD Exmor CMOS sensors (1920x1280), the PMW-200 is able to achieve high resolution (1000 TVl), high sensitivity (F11@2000 lx), low noise (56 dB), and wide dynamic range. The PMW-200 can be used for both SD and HD applications. It can be set to record 50 Mbps MPEG HD422 as MXF files on UDF formatted cards just like the PMW-500 memory camcorder or the PDW-700/F800 optical disc based camcorders. Or you can set the camcorder for FAT mode recording to shoot SxS cards which are compatible with the XDCAM EX format made by the PMW-EX1/R or PMW-320/350. For SD applications you can make DVCAM recordings as either MXF files or XDCAM EX compatible files. In the UDF/MXF recording mode, you can record Full HD video (1920x1080) at up to 50Mbps using MPEG HD422 compression technology and enjoy the benefits of proven, high-speed and intuitive XDCAM HD422 workflow. With the PMW-200, you can also record video in MPEG HD (420) or DVCAM format. The Sony PMW-EX1R is a flash-memory based high definition camcorder capable of a variety of frame rates and resolutions using Sony's new XDCAM-EX intraframe codec. The Exmor 1/2" CMOS sensors used in the PMW-EX1 provide unprecedented levels of image clarity previously unavailable in the prosumer market. Sony's sophisticated SxS Pro memory cards add a unique dimension to almost any production. INCLUDED IS ONE 8gb CARD. Additional cards 8gb and 16gb are available on this page. Enhancing both usability and workflow efficiency, the PMW-EX1R has an extensive set of features that push the boundaries of traditional handheld cameras, including a continuous record time of up to 140 minutes! Whether shooting in 720p, 1080i, or 1080p modes, the PMW-EX1 has it all covered. Its bevy of output settings lets users take advantage of fast and slow motion, as well as popular frame rates such as the "film-like" 24p mode.